Sam Shepard’s new play Heartless at Signature Theater is unlike anything he’s written in years, possibly decades. It has the kind of freedom and theatrical unpredictability that were Shepard’s stock-in-trade before he started writing the family plays for which he is best-known (Curse of the Starving Class, Buried Child, True West, Fool for Love, and A Lie of the Mind). Even in those plays, despite their recognizable family facades, deceptively naturalistic action gets exploded by extremely weird gestures, images, and flights of speech that hover in some stratum between poetry and internal monologue. I don’t know if Shepard has ever given himself as much freedom to depart from logical, rational plot and character development, though, as he does with Heartless. Really, Shepard spares no opportunity to knock the audience back in their seats going “Whaaaa?” A play this hell-bent on impossible convergences and enigmatic happenings will never qualify as a crowd-pleaser. My companion had never seen a Shepard play before and didn’t enjoy its disjunctive, logic-defying antics. I enjoyed it tremendously, but then I’m steeped in the canon of Shepard works like Action and Suicide in B-Flat and Buried Child, which play games with your head. The playbill prepared me for something intriguing and strange as soon as I took my seat – a Sam Shepard play with four female characters and only one male? Unprecedented! And an epigraph from, of all people, Eugene Ionesco, author of The Bald Soprano and other plays that epitomized post-WW2 Theater of the Absurd? Someone I would never have guessed would appeal to Shepard. The script includes a second epigraph from a similarly unexpected source, Nabokov, as well as a thank-you to Sylvia Plath. After seeing and reading and writing about Shepard for more than 30 years, I can’t tell you how thrilling it is to be truly surprised by a play of his. Heartless only runs til September 30. I hope I get to see it again because I doubt if it’s a play that’s going to be produced that much. But it’s a major contribution to Shepard’s body of work. It returns to one of his essential themes, the slipperiness of identity and how we’re haunted not just by our own past and family history but by the selves we might have been, the parts of ourselves that no one sees but that show up in our daydreams and our nightmares, the different selves that emerge in different contexts and different relationships. “Double nature,” Shepard called it in an interview about True West. “It’s a real thing, double nature. I think we’re split in a much more devastating way than psychology can ever reveal. It’s not so cute. Not some little thing we can get over. It’s something we’ve got to live with.” The doubleness shows up several ways in Heartless. All three of the younger women have a strange ever-shifting relationship to one another. Witness the character of Lucy, who is one of two sisters and one of two nurses. Sally treats her like dirt and speaks more affectionately to Elizabeth, who may or may not be a hallucination, the living representation of the murder victim who provided the organ for a heart transplant Sally had as a child. Lucy also has to compete with Elizabeth for her mother’s attention. Eventually she winds up running off with Roscoe – her attachment style, especially when she’s been helping herself to Mable’s pain-killers, is indeed loosey-goosey. Shepard fields these internal machinations masterfully, circumventing easy explanations or heavy-handed symbolism. 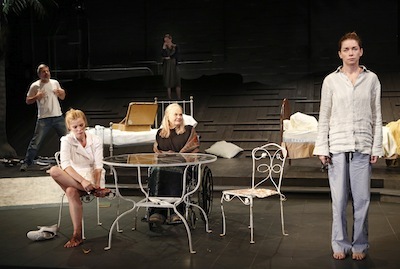 As a leap of writerly freedom, Heartless reminded me of Three Tall Women, the strong and original play with which Edward Albee pulled himself out of a decades-long slump and proved that there was plenty of fuel left in his tank. Daniel Aukin isn’t a director I would ever have imagined getting picked to direct the premiere of a Shepard play – he staged Amy Herzog’s 4000 Miles and most of Melissa James Gibson’s quirky comedies at the Soho Rep. He did a pretty good job preserving the mysteries of Heartless, including any number of wordless scenes that seem to conjure techniques from Joseph Chaikin’s Open Theater, where actors flicker between external and internal realities. I thought Gary Cole was miscast as Roscoe – too young and blown-dry – but the other performers were quite amazing and brave. Julianne Nicholson manages to be lovely and mean and lonely without begging to be loved. Betty Gilpin as Elizabeth applies herself to a series of character transformations without missing a beat. And Jenny Bacon as Lucy and Lois Smith as Mable feast on the juicy, deep, strange characters Shepard has written for them. The play could almost be a gender-reversed Buried Child – instead of Shelly tagging along to a visit with Vince’s Midwestern gothic grandfather and creepy uncles, here’s Roscoe outdone by a household of titanically confounding women. Shepard scholars will have fun parsing this play for years.